Includes an exclusive conversation between Meryl Streep and Anna Quindlen! Marriage: "A safety net of small white lies can be the bedrock of a successful marriage. You wouldn't believe how cheaply I can do a kitchen renovation." Girlfriends: "Ask any woman how she makes it through the day, and she may mention her calendar, her to-do lists, her babysitter. But if you push her on how she really makes it through her day, she will mention her girlfriends. " Our bodies: "I've finally recognized my body for what it is: a personality-delivery system, designed expressly to carry my character from place to place, now and in the years to come." Parenting: "Being a parent is not transactional. We do not get what we give. It is the ultimate pay-it-forward endeavor: We are good parents not so they will be loving enough to stay with us but so they will be strong enough to leave us." 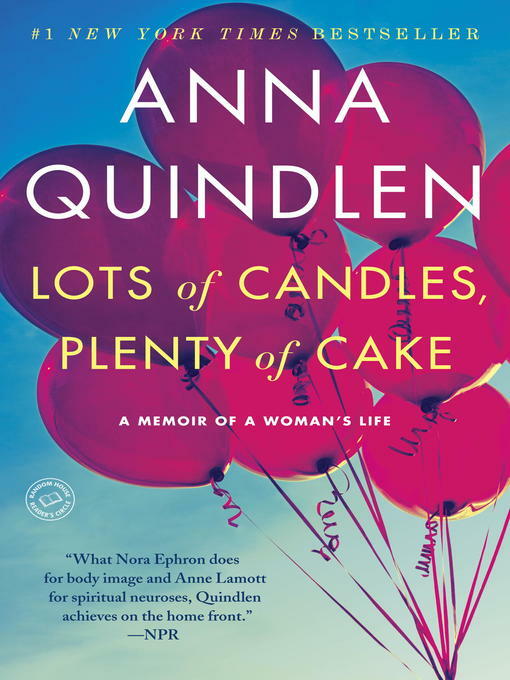 Candid, funny, and moving, Lots of Candles, Plenty of Cake is filled with the sharp insights and revealing observations that have long confirmed Quindlen's status as America's laureate of real life.